Huckstorf Diesel is going straight to the source to give you the customer the best possible deal, with warranty, on a new 6.5 PMD. Flight Systems Electronics Group manufactures this Pump Mounted Driver (PMD). Some people refer to these as Fuel Solenoid Drivers (FSD). This unit can handle the high temperature environment that is causing problems with existing drivers. FSEG has earned outstanding supplier awards from NASA, automotive manufactures, and original equipment manufactures. Exacting standards have been a hallmark of FSEG for more than 30 years. What they created was an outstanding product that holds up great! These PMD modules are a direct bolt in replacement for the original. 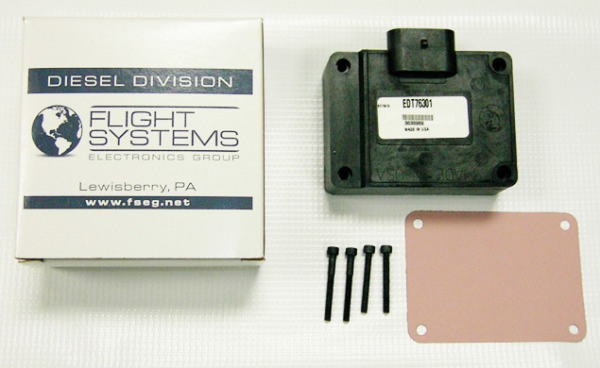 Flight Systems PMD's have a one year 50,000 mile warranty. Flight Systems manufactures diesel components for Chevy/GM, Dodge, Ford and International trucks.